East Vancouver – 1773 Kingsway – This location features a large training classroom that offers Red Cross full first aid and CPR courses, re-certifications and Food Safe Courses. For more information about courses or registration visit the course page of your choosing from the main or side menu. This location also serves Red Cross and food safe students in the Burnaby region as it is located just northwest of Burnaby. East Vancouver – 4255 Inverness – This Vancouver location is our largest training center. It is an auxiliary training site for us during the busy Summer months. With plenty of parking and large classes it is an ideal location for first aid and CPR courses including childcare and emergency first aid. Downtown Vancouver – 250 Smithe Street – This location, situated in Vancouver’s Down Town Yaletown area, is a comfortable and convenient location for customer’s looking for full Red Cross first aid and CPR courses in Down Town. The location features several large classrooms. This location only offers Red Cross courses on the weekends. Surrey Newton – 7238 137th Street – Located in the heart of the Surrey Newton business district, this classroom is situated in a new building surrounded by plenty of places to eat and free parking. Courses offered here include Red Cross first aid and CPR full courses, re-certification’s and Food Safe training. 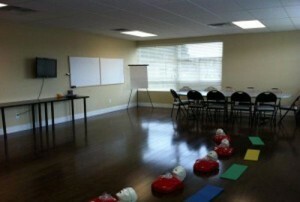 This location comfortably serves the Surrey and Delta municipalities for first aid, CPR and food safety training. Surrey Whalley – 10114 King George Blvd – This location is centered in the heart of Whalley Surrey. Plenty of parking and easy access through public transit including LRT lines. Courses offered here include full Red Cross first aid and CPR programs. Coquitlam – 927 Brunette Ave, Coquitlam, BC V3K 1C8 -This location is on the corner of Brunette and Lougheed. It’s central to transportation and provides plenty of free parking. We are located in office “d” and entrance is from the North side of the building. Plenty of amenities are located nearby. Abbotsford – Coming soon – We hope to open our new Abbotsford B.C. location in the winter of 2016 / 2017. Check back soon for more information. Richmond – Coming Soon – We are scheduled to open our Richmond location in the Summer of 2017. We also have training locations expanding throughout the Lower Mainland. New locations are being opened in Richmond as we continue to expand and offer first aid, food safe and CPR training throughout Vancouver. To register or to view more information about each location visit the location pages from the main menu. Registration and location selection can be completed through the course registration pages viewed from the main or side menu.